FLYtag®, the best-selling flyable RFID parts marking solution, is the choice of the leading aircraft manufacturers and subsystem suppliers of the aerospace industry. 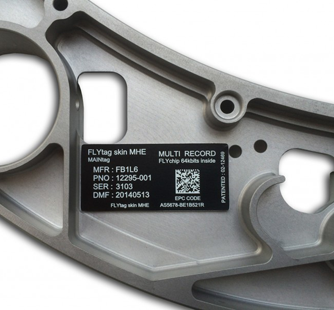 MAINtag inventor of the hybrid integrated RFID label has especially design FLYtag® skin to allow metal/carbon and non-metal parts to meet all required specifications for flyable parts. FLYtag® skin is engravable, adhesive, cost-effective and versatile. It is very low profile and flexible to fit curved surfaces. Complying with SAE – AS5678 / ATA Spec 2000 Chap. 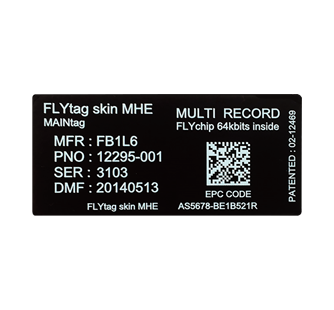 9 / TDS 1.11, FLYtag® skin is built around FLYchip® the best Dual/Single (2 Kbits) and Multi-record (64 Kbits) passive contactless UHF technology and meets ISO 18000-6C and ATA Spec 2000 Chap. 9-5 Appendix 11 standards. The EPC structure complies with the latest TDS 1.11 standard. Data retention is over 30 years. The adhesive packaging and chip are designed in accordance with SAE-AS5678 requirements. FLYtag® skin can be used in cabin & non-pressurized areas. Communication with the chip, including access to all user memory, can be performed by any standard Gen2-compatible reader. FLYtag® skin supports all mandatory functionalities and modes as defined by the ISO/IEC 18000-6 Type C (EPCglobal Gen2) air interface specifications, including Miller encoding. Proprietary or non-standard commands are never necessary. Chemical compatibility . Low humidity absorption, hydrolysis proof, high compatibility with lubricants and hydrocarbons.